This book explores the remarkable religious renaissance that has reformed, revitalized, and renewed the practices of Buddhism and Daoism in Taiwan. Democracy's Dharma connects these noteworthy developments to Taiwan's transition to democracy and the burgeoning needs of its new middle classes. Richard Madsen offers fresh thinking on Asian religions and shows that the public religious revival was not only encouraged by the early phases of the democratic transition but has helped to make that transition successful and sustainable. 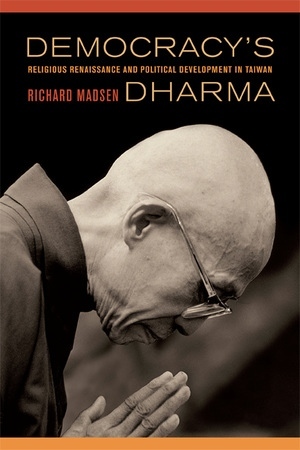 Madsen makes his argument through vivid case studies of four groups—Tzu Chi (the Buddhist Compassion Relief Association), Buddha's Light Mountain, Dharma Drum Mountain, and the Enacting Heaven Temple—and his analysis demonstrates that the Taiwan religious renaissance embraces a democratic modernity. Richard Madsen is Professor of Sociology at the University of California, San Diego. He is coauthor of Habits of the Heart(UC Press, 1985) and The Good Society (1991), and is the author of China’s Catholics (UC Press, 1998) and many other books.